These 10 cities had the highest level of year-round pollution and some of the highest incidences of heart and lung issues as well, according to the American Lung Association's annual report. Criss-crossed by major roads, including California's Route 99 and Route 140, which takes many travelers to Yosemite National Park, Merced has long struggled with ozone and emission-related pollution. In fac,t, some 80% of the area's harmful pollutants can be traced to transportation sources, said Bonnie Holmes-Gen, senior director for policy and advocacy for the American Lung Association in California. However, Merced is making progress in reducing its ozone levels, with the pollutant hitting it lowest level in 14 years, she said. 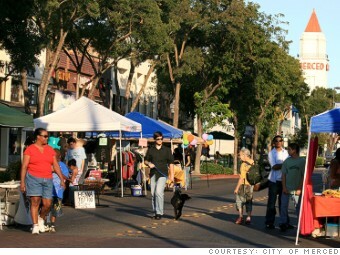 Another issue facing the town is its proximity to San Francisco and Oakland. Jared Blumenfeld,of the EPA, estimates that as much as a quarter of the pollutants in Merced drift in from those metro areas. 1. Ranking is based on year-round particle pollution. This is in the air we breathe and consists of such things as dust, metals, smoke, exhaust, pollen and acids, like nitrates and sulfates. 2. The data for cardiovascular disease includes all cases in a given city whether they were caused by air pollution or not. Air pollution puts those with cardiovascular disease at a higher risk of health issues. 3. Ozone is created when a chemical or fossil fuel, like coal or gasoline, is partially burned and the unburned hydrocarbons, when combined with ultraviolet light, form a gas that is very corrosive to lungs.